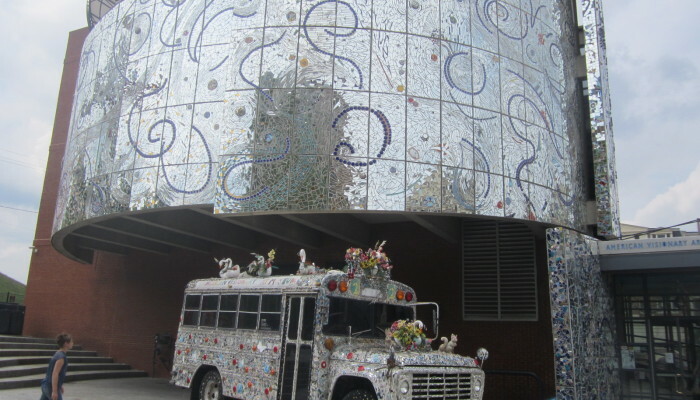 My friend Jess said I had to visit the American Visionary Art Museum right away because they had an exhibit on storytelling with quilts. Yep – she knows me well. 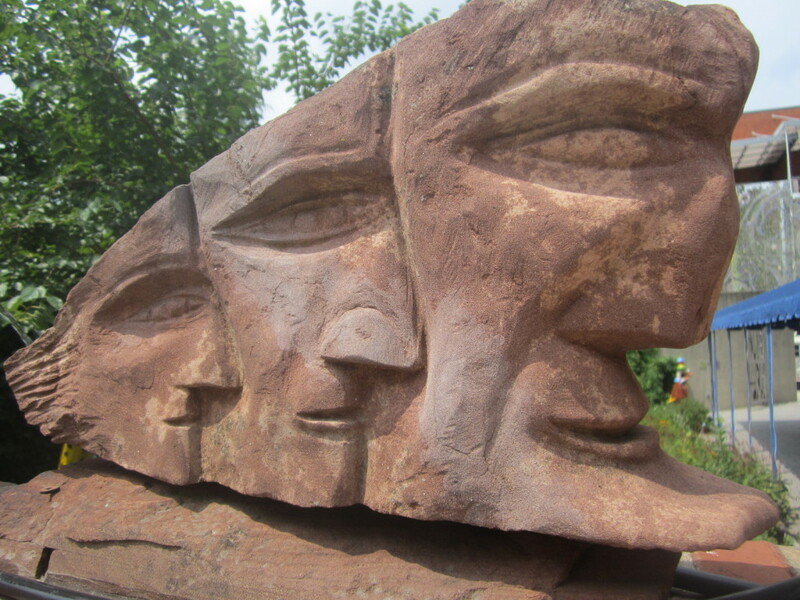 We first heard about this museum when we attended the Kinetic Sculpture Race earlier this year. In fact, some winning entries from this race are on display in the museum. 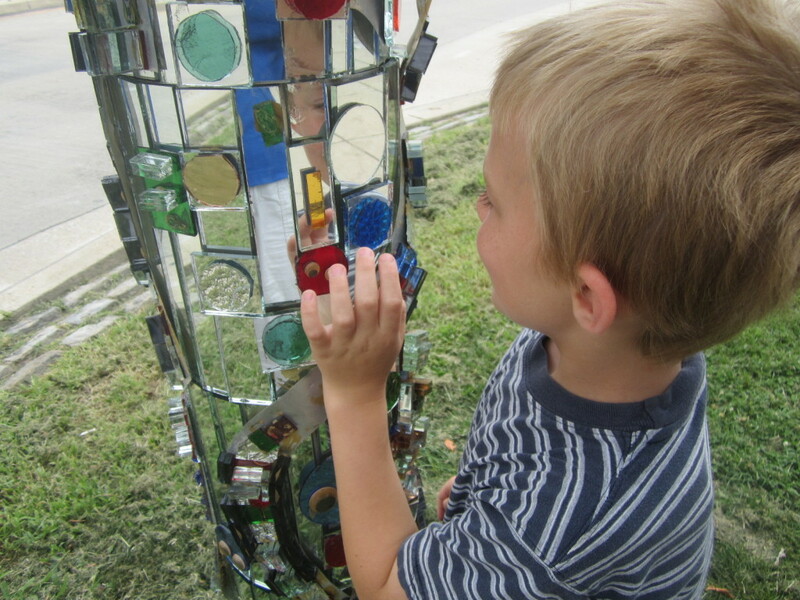 As we came around the corner to the museum, we saw a glittering tree and a wall covered with shiny bits of mirror and glass. Ah! The force is strong with this one. 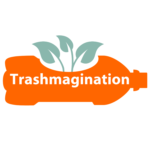 Trashmagination is alive here in the sunshine. 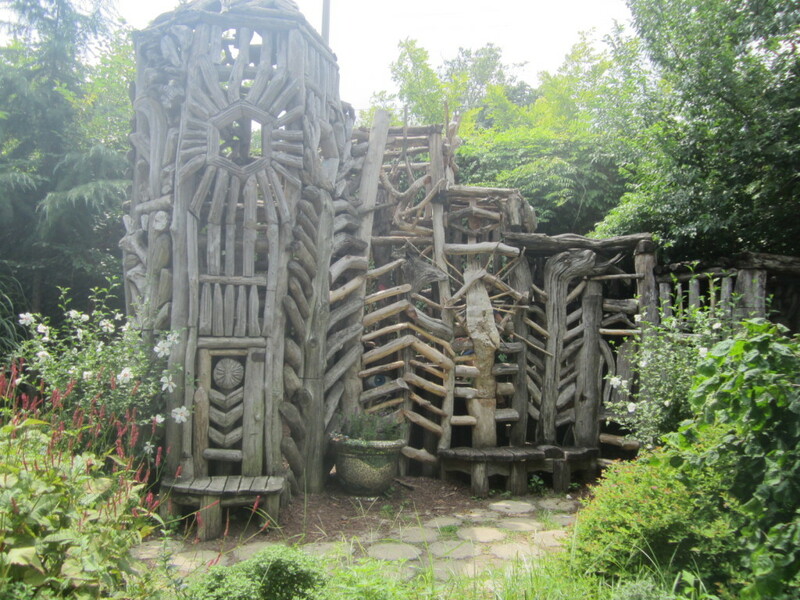 Around another corner was a garden with a wooden structure that our kids would like us to replicate at home called Meditation / Wedding Chapel, sculpted by Ben Wilson. In fact, the staff were setting up for a real wedding in the space near this structure – a lovely spot for a wedding! 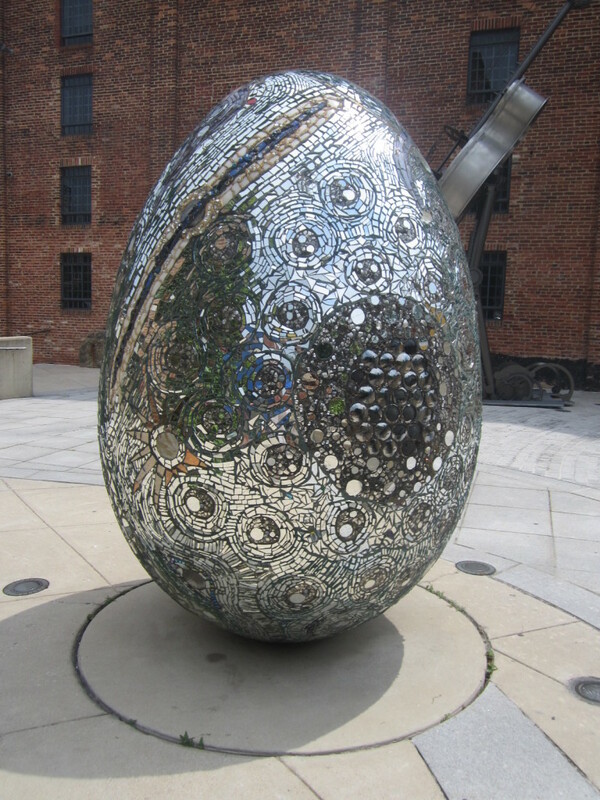 There was a large glittering egg in the courtyard called Cosmic Galaxy Egg, sculpted by Andrew Logan. So those are all the photos I can show because photography is not allowed in the museum, so I’ll do my best to describe the exhibit called The Art of Storytelling: Lies, Enchantment, Humor and Truth, at the museum until September 1. You can also see great photos at their website. There are many permanent exhibits at the museum, but the one I wanted to see the most was a series of quilts by Esther Nisenthal Krinitz. She made quilts describing her life before World War II and all the harrowing experiences of her family through the Holocaust, all the way until she immigrated to the United States. Esther’s quilts are exquisitely sewn and laden with so many emotions – from the joy of pre-war life, to the intense suffering in the camps. I found it very difficult to look at the quilts. When people live through such suffering and loss, I’m guessing that at first you try to push it away, and that was my first feeling when reading her story. But so often we know that living the story in great detail can be therapeutic, and that is what Esther did here. As a quilter, I know the hours it would have taken to make them. Being able to capture her memories for her children and grandchildren, and also being able to create something beautiful, it was what Esther needed to do. In the documentary about Ester, Through the Eye of the Needle, she describes how quilting the memories was therapeutic. Sewing tiny stitches or hooking a rug is a wonderful combination of creativity and mundane repetition, a good path to healing or at least living with positive intent. Seeing Esther’s quilts in person made me realize that you really cannot feel fabric art on the web. Maybe other types of art, but not fabric art. It is imperative to see the dimensions of the stitches and the subtle textures on the fabric. So I’m very glad that Jess got me to go in person! Yeah! Russell’s Favorite Exhibit – Flatulence Post by Bob Benson was appropriately located by the restrooms in the basement of the museum. Through a series of stained glass and other art forms, it highlights the history of the fart in modern culture. And while Russell was doubled-over laughing every time he found another fart joke, his favorite thing was pressing the button on the Flatulence Post for a series of recordings played loud and long. I think any parent could bring a book and ear plugs, and get two or three hours of entertainment from this exhibit. Nora’s Favorite Exhibit – Fairy Tree House by Debbie and Mike Schramer were two incredibly complex moss-covered houses. The complexity of all the little fairy-sized furniture made from natural objects was stunning. Seashell sinks, birch bark stoves, acorn cups – if you have ever made a fairy house, this exhibit makes you want to go back and take it to the next level. Bob’s Favorite Exhibit – London’s Cabaret Mechanical Theatre automata is a series of sculptures where you turn a crank and they move. Many in this museum are made by Paul Spooner, and include items such as a man eating spaghetti in a bath tub, fish jumping through waves, You can see how many of them work at the Youtube channel for the Cabaret Mechanical Theater. I think Bob would love to build some of these and knowing Bob, he would do an amazing job. Anything that combines humor, art and engineering is his sweet spot. 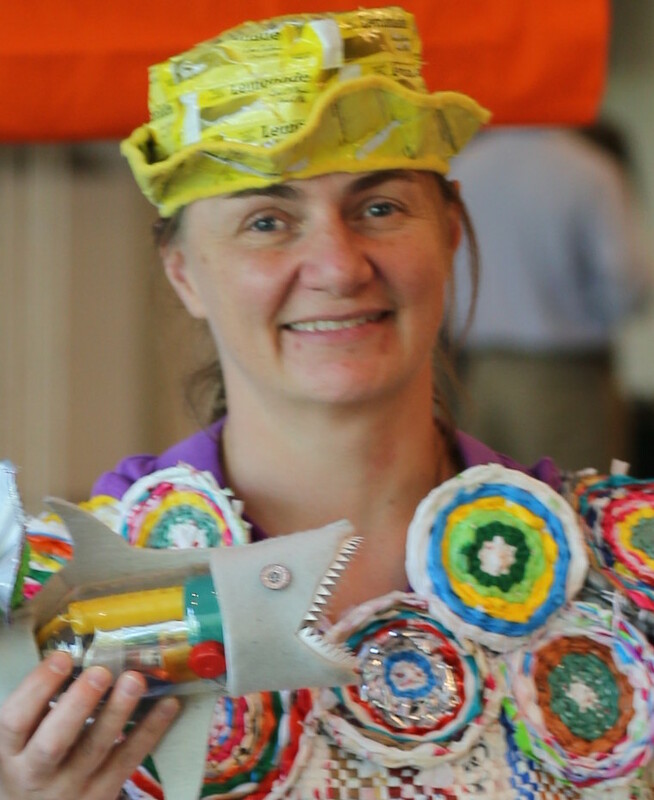 One More Carla and Bob Favorite – All the fabric art by Chris Roberts-Antieau made me want to run home and sew. The best photos I found of her work are in this article from Time Magazine about her. So I can’t do this museum justice with one blog, or one visit, really. It’s the kind of place you need to go if you are feeling any kind of creative block. It’s a node for people who want to live vividly. Yes, many of the exhibits are very heavy. For example, there is an exhibit right now of self-portraits by Cambodian street children, or the quilts made by South African women during the Truth and Reconciliation Commission. But if these folks, who have been through so much, can find the energy to tell stories – what is stopping me? It becomes an imperative to become an active human being when you see this level of giving. There is also a great gift shop with some balls of sari yarn for only $8, a bunch of costume jewelry Nora would really like for her stocking this year and a wooden cube man that kept Russell busy for about 30 minutes. Thank you Jess, Mona, Charlotte & Lilibet for going to the museum with us! It was quite an amazing day, given that we also saw Aengus Finnan in concert that evening. We are lucky to live in a place filled with such creativity.